Chickamauga Battlefield just South of Chattanooga is one of the most haunted battlefields in the world. In the United States, it is second only to Gettysburg. I have begun researching Chickamauga for my new History Press book, Haunted Chattanooga, and what is most interesting about Chickamauga is that it seems to have been haunted long before the first shots of The Battle of Chickamauga were fired. The Battle of Chickamauga was a bloody affair killing 35,000 men and leaving the ground littered with corpses and the air filled with the scent of decay for months to come. Yet even before this, Chickamauga was linked to darkness, death, and demons. Chickamauga was named for the Chickamauga River that runs through the battlefield. This river was named by the Cherokee people who were in the area long before the white man set foot there. Although the exact translation of the word Chickamauga is often disputed, it is widely believed that Chickamauga is upper Cherokee for "The River of Blood." It is believed that the Cherokee people named Chickamauga the River of blood because after the white man came they brought disease with them. Small Pox decimated the native population. It killed more natives than any guns and it is said that the Cherokee people who were infected with small pox went to the river to die. They named the river the river of blood because so many people died there. So death clings to Chickamauga like a wet cloth and the ghosts of the battlefield are so many they can't even be listed. One of the most famous things that haunts the battlefield is thought to be older than even the natives. Old Green Eyes has been seen by innumerable visitors to the battlefield and his legend is well known throughout the Southeast. Old Green Eyes is a demon like creature with green eyes and sharp teeth. He has long claws and an almost human aspect about him. There is much debate over what Old Green Eyes is. Many believe he is a demon. Others say he is an elemental being of some kind. After the battle of Chickamauga, he was seen in the tall grass on Snoddgrass Hill feeding off the dead. The living still see him watching from the shadows with his glowing green eyes. I would not want to run into Old Green Eyes while visiting the battlefield. It sounds like a creepy demon creature. wow...that one is really cool...how do you find out about all these wonderful stories?!!! I think this year is the 150th anniversary of the war ... The washington post is "tweeting the Civil War in the words of the people who lived it 150 years ago - from journals, letters, records and newspapers"
I have only been to a few Battlefields ... the ones around DC. 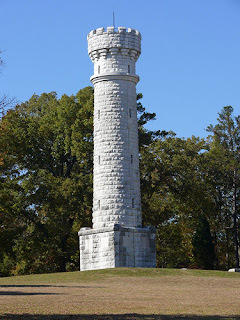 Have you been to Chickamauga? BTW, I am 68% (according to my Kindle) of the way through The Rite. Saw your great post on the movie. I'll look forward to seeing it. Haven't seen The Last Exorcism yet. There is a book by Cherie Priest (fictional) that deals with Old Green Eyes and the ghosts of Chickamauga Battlefield. It's the second in a series, but don't let that worry you. It's a scary, creepy read. I have been to Chickamauga battlefield and it is a beautiful place. With all the death there, it's no wonder the place is haunted. No you don't. As someone who has he is NOT a fun critter.